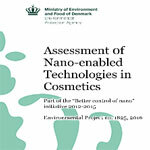 As a part of the ‘Better control of nano’ initiative 2012-2015, the Danish Environmental Protection Agency published a report on nano-enabled technologies in cosmetics. Accompanying this report is an appraised database summarising the literature which formed the basis of this review. This report reviews the available literature on nano-enabled technologies for cosmetic products, specifically addressing soluble nano-transporters. Accompanying this report is an appraised database summarising the literature which formed the basis of this review which addresses the following areas: Types and uses of soluble nano-transporters in cosmetic applications; assessment of the extent of dermal absorption/ penetration of nano-transporters; evidence of dermal/ systemic toxicity arising from interactions with nano-transporters; identification of nano-specific characteristics that may influence dermal absorption/ toxicity of nano-transporters; assessment of the specific research areas that require more knowledge and to discuss to which extent provisions on nanomaterials in the cosmetic regulation are to be applied for nano-transporters.